At Ellpha we believe that gender equality is not only a fundamental human right, but a necessary foundation for a peaceful, prosperous and sustainable world. If women—who account for half the world’s working-age population—do not achieve their full economic potential, the global economy will suffer. A “best in region” scenario in which all countries match the rate of improvement of the fastest-improving country in their region could add as much as $12 trillion, or 11 percent, in annual 2025 GDP. 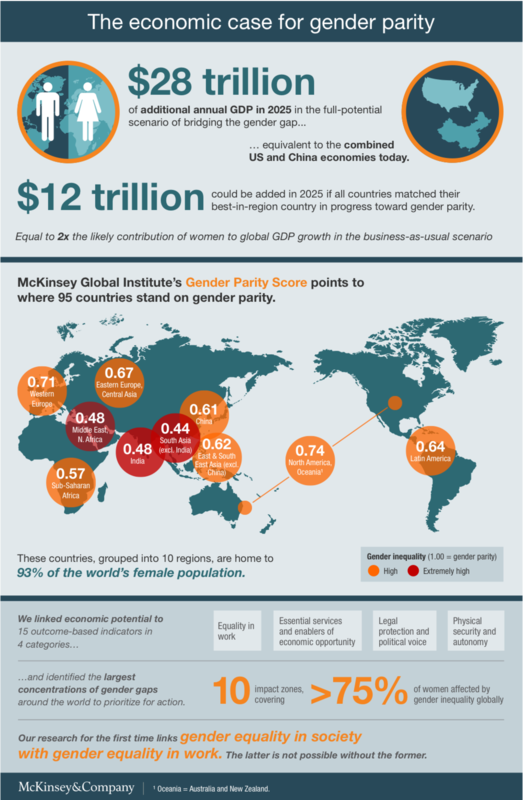 In a “full potential” scenario in which women play an identical role in labor markets to that of men, as much as $28 trillion, or 26 percent, could be added to global annual GDP by 2025.
unlocking the full value of gender equality is an economic imperative. Studies and research make it clear: addressing gender inequalities, across the globe, will drive economic growth, create value for businesses, BUILD happier and healthier communities.